When we asked our Twitter followers – who all seem to be foodies – where they thought was doing great Indian food at the moment, more than half of them recommended Planet India. Having eaten there before we knew it was good but we were slightly taken aback by the enthusiasm. For a start it’s a cheap place – a plate of two curries and rice weighs in at about a tenner. But also it’s totally vegetarian, not that you’d really notice. You’ve got to start with the samosa chaat (£6.07), not least because it’s one of the oddest starters you’ll ever have – a mix of yoghurt, Bombay mix-like Indian snacks, fresh salad, spices, coriander and crushed samosas. Spicy, sweet, fresh, crispy – it’s hard to make sense of but so good, trust us. From there we have six curries between the three of us, thanks to the innovative ‘half and half’ (£4.07 each potion) method. Running through them quickly, the black chickpea curry has the dry heat of the hottest summer’s day, while the vegetable curry is hearty and healthy like a good stew. The Masoor dall, perhaps the best of the bunch, is a very smooth but surprisingly hot lentil curry, creamy and delicious. The spinach and paneer curry has plenty of soft spinach mixed in with large cubes of deep fried haloumi-like cheese, which are a little overpowering. Back on the dhals and the takda variant is like a mild, but extremely salty, tasty lentil soup. Finally the sweetcorn and patra curry features a tomato sauce and big chunks of soft vine leaves. It’s zingy but not so hot as to break a sweat. Although a little rough around the edges – the water comes in an old orange juice bottle, you eat with spoons – Planet India is a gem of a place. 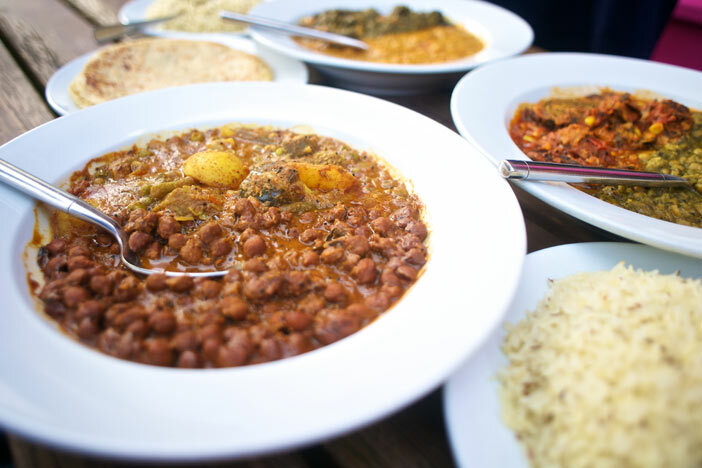 It’s the closest to the Indian food we loved when we spent time there – “authentic homemade Indian food by authentic homemade Indians” is how they describe it. Cheap, healthy and without the worry of meat morality, there really isn’t much not to like here. But you all knew that already, right? We were sitting outside, so probably not.